My friends once asked me what kind of desserts that I really love, my list is Tiramisu and lemon pie. 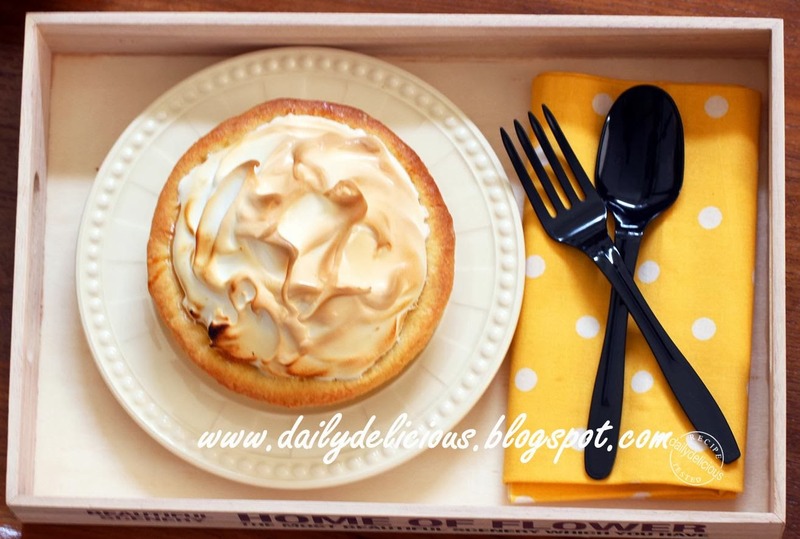 So if you notice I have a lot of lemon pie in my blog ^^. 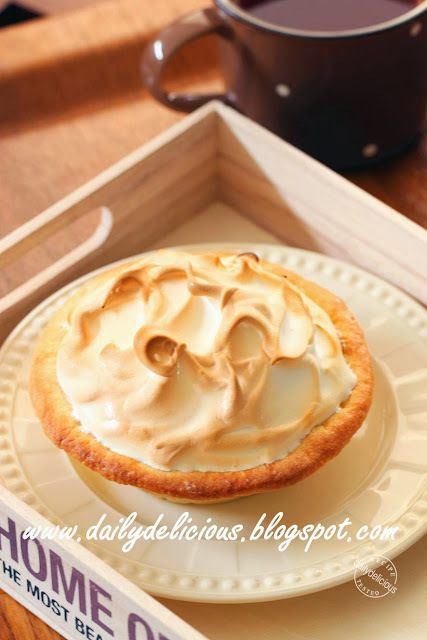 This time I make simple lemon meringue pie, sweet pastry with buttery curd and Italian meringue on top. I try new recipe for the pastry, while making it, I was really afraid that it will be tough because the texture of it, look as if it developed too much gluten. But it come out fine and delicious, the point is while mixing the butter into the flour try your best to mix it through the butter will prevent the pastry to become tough. Baking blind is the technique we use when making a pastry that you want to fill it with cream or curd, to prevent the pastry to become soggy, brushing the pastry with egg white and bake will crate a shield for the pastry. This curd is very delicious, but it will be liquid in hot temperature so I suggest you to refrigerate it before serving because the curd will be firm and the meringue will be chill and delicious. You can use any method to burn the meringue but I find grilling is the best because the color of the meringue will brown through and beautiful. Use your fingers to mix the butter into the flour mixture until fully combine, the mixture will resemble small bread crumbs. Mix the egg and yolk together and pour into a bowl. Use pastry cutter or spatula to mix the dough together, just until the mixture is moistened. Pour the mixture onto the work surface and use a palm of your hand to mix the dough. Cover with plastic warp and refrigerate for at least 30 minutes. Meanwhile put all the ingredients for the lemon curd except butter into a pan, put over very low heat whisk all the time, and heat until thicken (as the curd thicken the bubble will be less), take the pan out of the heat and put the butter into the pan, let it melt for 1-2 minutes then stir until combine. Put the plastic warp directly on the curd let it cool and refrigerate until ready to use. Roll the pastry and cut into 4 rounds (I use 10 cm tart pan), you can reroll and cut until you get 4 rounds, if the pastry too soft refrigerate before rolling again. Cover with plastic warp and refrigerate for 1 hour before baking. Preheat the oven for 190°C. Line the pastry with baking paper or aluminum foil, weight with baking beans and bake blind for 15 minutes, then remove the baking paper or aluminum foil, and bake for another 8 minutes. Remove from the oven and brush with egg white, and bake for another 4 minutes. 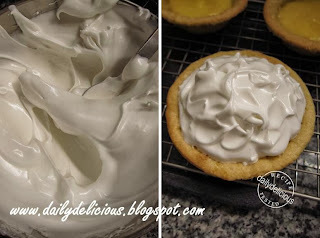 Remove from the oven, let it cool a bit before filling with the curd, and refrigerate while making the meringue. The syrup is ready when it reaches 115°C; pour it over the egg whites and continue whisking until cold. Spoon the meringue over the curd, and put under a grill or in a hot oven ( 200°C.) 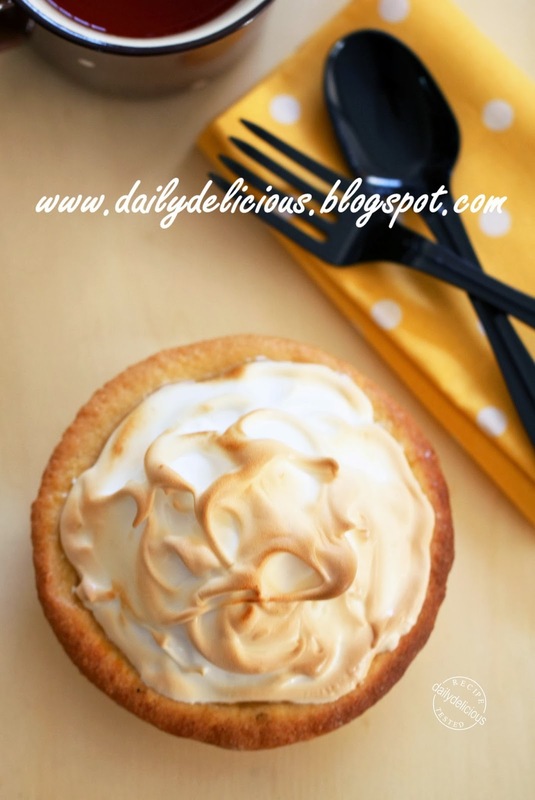 until the meringue is brown. Refrigerate for at least 2 hours before serving ( the curd will set). 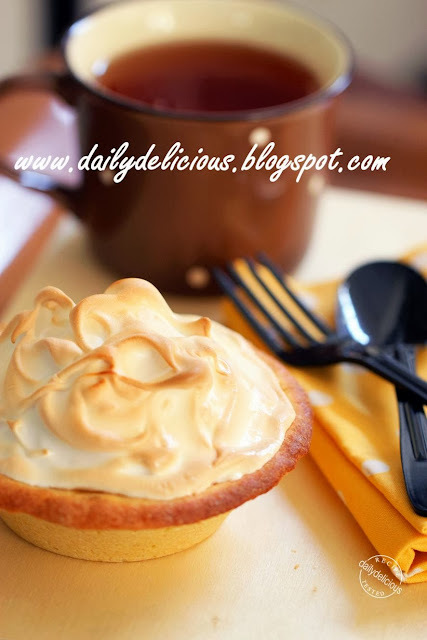 Hi is it ok not to bake the meringue as I just want to use it to deco my cake? Love your blog. Can you please give printer friendly posts? It will so easy for us to print your recipes. Thank you. Looks amazing! 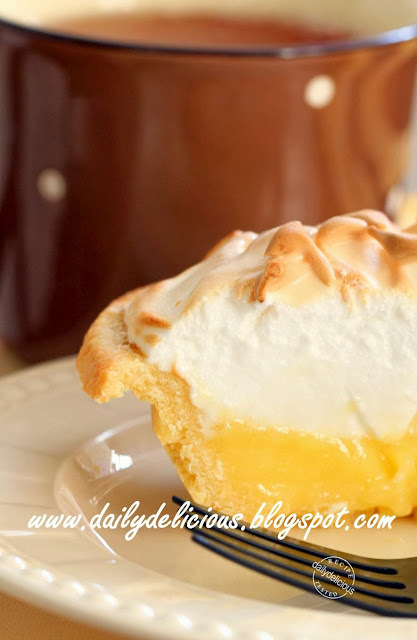 I love making pies and I will have to try this!